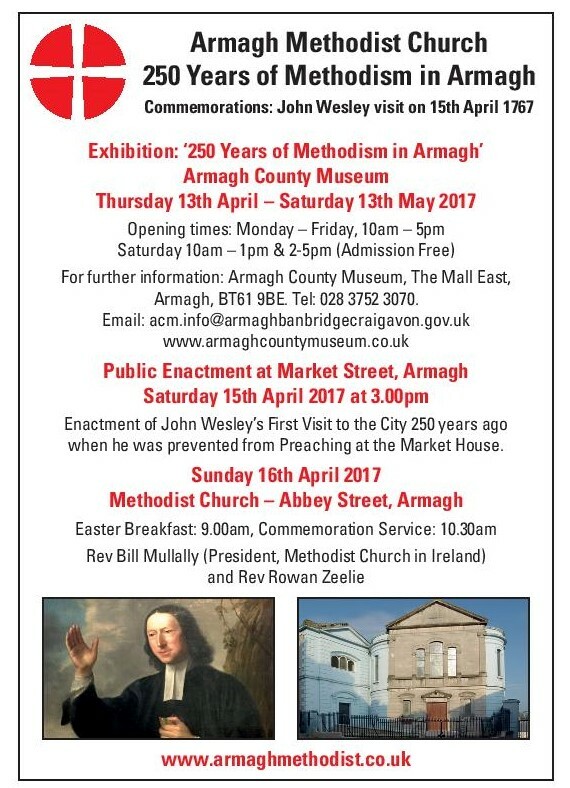 15 April 2017 will mark the 250th Anniversary of John Wesley’s first visit to Armagh. Part of our commemorations will include an exhibition at the local County Musem and a re-enactment of Wesley’s arrival (and subsequent removal from the Market Square). The President of the Methodist Church in Ireland, Rev Bill Mullally will be with us for the weekend’s events and will lead us in worship on Easter Morning at 10.30am in Abbey Street, Armagh. Commemoration coins marking this important event in the history of our church have been minted and these are available to purchase from the church for £10 each (includes coin and case).